Winter ills have laid me low for the passed couple of weeks. I’ve had the sniffles and a hacking cough that has the unhappy knack of reasserting itself just when it lulls me into thinking I’m on the mend. A lack of appetite and the inability to discern flavour has dictated my mealtime choices of comfort foods fortified with citrus, ginger and garlic. I’ve lived on chicken soup, congee, risotto and steamed greens, interspersed with the odd meal of fish. I’ve lost count of the number of mandarins I’ve snacked on and oranges I’ve squeezed for their juice. This simple dinner time dish requires little energy and minimal time to prepare. While in essence it’s simply steamed fish and blanched Chinese greens, the savoury sauce loaded with spring onion and ginger flavour means it’s all at once assertive and restorative. Barramundi AKA Asian sea bass is my local fish of choice. It thrives in Australia’s warm northern waters. It’s a beautiful fleshy fish that lends itself to Asian style cooking and flavours. I insist that it’s wild caught though as those that are farmed have a distinct muddy flavour I find distasteful. 2 medium heads of bok choy, quartered lengthwise. Combine all the sauce ingredients in a small pot, bring to the boil and simmer for 10 minutes. Line a bamboo steamer with a piece of baking paper. Pat dry the fish and season with salt and pepper. Put the fish into the steamer then cover with the lid. Put the steamer into a wok and water until 3cm lower than the base of the steamer. Bring the water in the wok to the boil, reduce the heat and steam the fish until it’s cooked, 10-14 minutes. Test by separating the centre with a knife. It will flake easily. Remove the steamer from the wok and set aside. Throw the greens into the water, return the wok to the boil and cook 1 minute. Drain, then divide the greens between two serving dishes. Place a fillet of barramundi on top on the greens then dress with the sauce. Garnish with fresh spring onion, extra ginger julienne and red chilli. Hope you will be all better soon! I know what you mean with the muddy flavor, here it happens with many freshwater fish and it’s awful. I like that you cooked the vegetables in the water with the fish drippings. Sorry to hear about the bug that has kept you so low. I wondered where you were as you have been rather quiet. I hope also that you are truly on the mend now. It is awful when you can’t taste the food you make- there’s no incentive for cooking. Hard to get ;real’ Barramundi- the farmed variety is very fatty too. It takes a lot to put me off my food but this bug has succeeded like no other, in fact it’s totally worn me down. Enjoy London, so much to see and do.. Since flu-shots and I do not agree and I do not believe in them anyway am keeping myself largely to nature and not people: one more month to go 🙂 !! Love the classic recipe ‘your way’ and really must look more into those infused oils! Hope the improvement continues without stumbles . . . . Thanks Eha, hopefully I’ve got on top of this monster for good, definitely the worst I’ve ever experienced. Cobram brand have a range of infused oil that are gut friendly and add a great punch of flavour. Err on the side of moderation with the garlic oil, it’s quite pungeant.. There are some nasty bugs around this winter, and I am sorry that one settled on you, refusing to leave. It is the simplicity of this recipe that appeals, and the clean flavours of the dressing. I’m where you were a couple of weeks ago. The worst of the flu is past but the dreadful cough is keeping us both awake most of the night. I’ve got through several litres of home made chicken soup… This looks yummy, and a nice strong dose of garlic and ginger sounds just the ticket! Today I feel as if I’ve turned the corner, let’s hope it’s not false hopes. Few seem to escaped with a dose of this winter bug, everywhere you go people are coughing. Hopefully the warmer weather will send it packing. Barramundi is not a fish we get in these here parts (as they say in the US). It looks delicious. I think a standard farmed sea bass would do the trick, if I could get one big enough to give chunky pieces like this. Hope you are soon on the mend. The end of last winter was terrible for colds that lingered, or reappeared just as you thought you getting better. This is exactly the type of food I crave when I am feeling ill.
I’ve never had a bug like this before, much more than the common cold. It takes a fair bit to kill my interest in food!! Sorry to hear that you’ve been ill and hope you are now (truly) on the mend. Heat is making me slow and groggy, so I know how it must feel – though without the coughing and sniffles, thank goodness. Missed your posts and I thought something was up when there was no Ladyredspecks’ IMK post. Really love this simple fish dish. It’s something to add to the comfort food category. Thanks Debi, it’s been a particularly bad winter for bugs that refuse to be beaten. I think finally I’m getting the better of it, but I’m saying it very quietly. Hope to see you back in best blogging form soon, but don’t rush it. Get well! 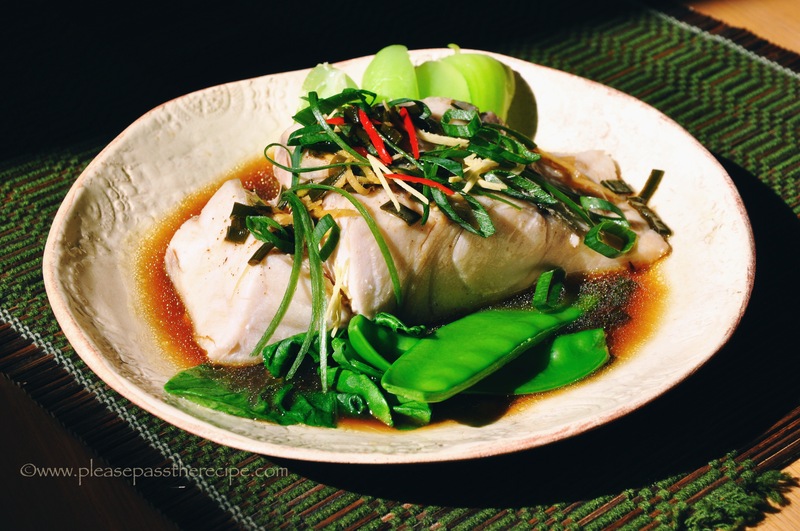 This entry was posted on August 10, 2017 by ladyredspecs in Cooking, FODMAP diet, Food, Gluten Free, Lactose Free, Light Savoury Dishes, Main Meals, recipes, Seafood Dishes and tagged Asian greens, barramundi, FODMAP diet, ginger, gluten free, sea bass, spring onions, steamed fish.